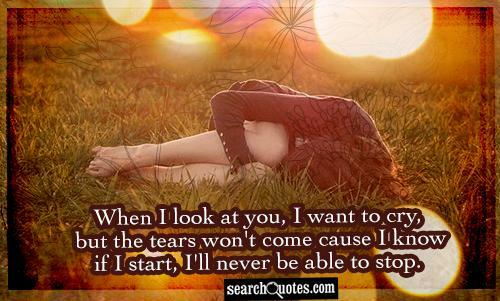 When I look at you, I want to cry, but the tears won't come cause I know if I start, I'll never be able to stop. 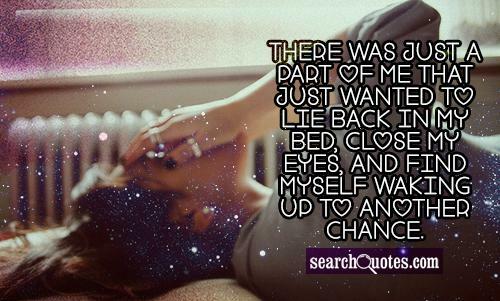 There was just a part of me that just wanted to lie back in my bed, close my eyes, and find myself waking up to another chance. They told me to find the girl I used to be. This morning I woke up with tears in my eyes. 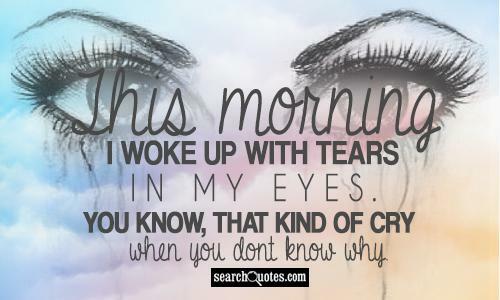 You know, that kind of cry when you dont know why. Tonight I walk through an empty street with my shadow stretching in front of me when my lonely thoughts meet my lonely feet and the cold reminds me that Ive chosen this life. Trust me, I know how it feels. I know how it hurts. I know you cry in the shower so no one will hear your screams. I know you wait until everyone goes to sleep to fall apart. 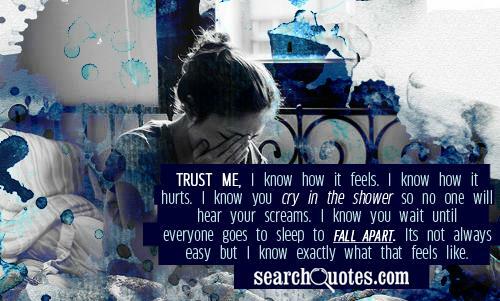 Its not always easy but I know exactly what that feels like. When I pictured myself it was always like just an outline in a coloring book with the inside not yet completed. All the standard features were there but the colors, the zigzags, the plaids, the bits and pieces that made up me werent yet in place. I was still waiting. She tries to be real but I dont even think she knows who the real her is anymore. Shes an artist, a painter actually. See that smile on her face? Its her most famous piece! Shes got eyes of innocence, the face of an angel, a personality of a dreamer, and a smile that hides more pain than you can imagine.